Liverpool have been expected to bolster their ranks further in January and after the signing of Daniel Sturridge, Inter starlet Philippe Coutinho is on the brink of becoming the next arrival at Anfield. Coutinho came through the youth system of Brazilian heavyweights Vasco da Gama, a club he initially joined at just seven years of age. Before he even made his debut for the club, the playmaker was already making waves. His exceptional performances in the youth team and internationally for Brazil Under-16 and 17s ensured he was quickly developing an impressive reputation. Real Madrid were amongst the big European clubs who circled for his signature, although it was Inter who eventually won the race, paying €4.2 million for the then 16-year-old in 2008. The Serie A club allowed him to stay with Vasco da Gama on loan until he turned 18 in 2010, when they made his transfer official and brought him to San Siro. By that point he had played over two seasons for the first team at his boyhood club, in the second campaign becoming a regular and important contributor to the side. He spent an initial 18 months in and around the Inter squad, making his debut in the Uefa Super Cup defeat to Atletico Madrid, although he never really established himself as a first-team regular. “Coutinho has always impressed with his technical qualities, but he’s always been considered too inexperienced to make a real mark during his time in Italian football,” explains Goal.com Italy’s Maurizio Piano. For the second half of the 2011-12 season, Coutinho was loaned to La Liga outfit Espanyol and he impressed under Mauricio Pochettino, now manager of Southampton. He played 16 matches as he helped the Catalan club to a mid-table finish and scored five times, two of which were particularly spectacular efforts – a free kick against Malaga and a volley against Racing Santander. Since returning from Spain, Coutinho would have hoped to improve his fortunes with Inter on the back of the confidence gained in La Liga, but most recently, an injury has also hindered his progress as he tries to force his way into the team. Now, despite the player’s stated wish to remain at Inter, it seems the club are determined to move him on, as they have done with Wesley Sneijder, to raise funds for new pursuits in the market. 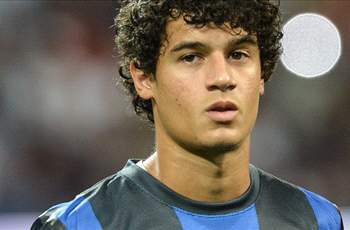 Maurizio added: “Coutinho has never really been seen as a certain starter for Inter. Now, the Nerazzurri need money to try and buy Paulinho from Corinthians. The Reds have been in the market for an attacking midfielder this month after allowing Nuri Sahin to leave Merseyside and rejoin his former club Dortmund, the Turkey international having failed to make an impact at Anfield. Wesley Sneijder was a Liverpool target until the Netherlands playmaker chose to leave Inter for Galatasaray. The 28-year-old was thought to be holding out for an offer from the Premier League, but could not be persuaded to wait for an offer from Anfield and joined the Turkish giants in a €7.5 million deal. Where Sneijder is a pass-master, Coutinho is a completely different kind of player, but is not lacking the kind of creative spark that saw the Dutchman regarded so highly. The Brazilian has often found himself lining up on the left-hand side at Inter and Espanyol, a position that has been rotated between youngsters Raheem Sterling and Suso at Anfield for much of this term. Possessing a lightning-quick burst of speed, but typically South American close-control, Coutinho is a flair player who will not think twice when taking a man on, with a penchant for lobbing his man. When cutting inside on to his right foot, the 20-year-old is an accurate finisher; indeed, his return of 15 goals from 96 career games is impressive for a youngster who has featured in a wide role in most of those appearances. With the teenaged Sterling feeling signs of burn-out after a whirlwind introduction to the Premier League, and Suso seeming to lack the speed required for the top-flight, Coutinho could be a happy medium between the two. Maurizio certainly feels he could be a success story at Anfield if the deal goes ahead, saying: “Even if at Inter he has been used at times as a midfielder, he really is more like an attacking midfielder or even outright attacker.